Fill your house with the rich, tangy aroma of simmering marmalade. A perfect antidote to the January blues. No need to have made marmalade before – the recipe we include is pretty fool-proof. Seville oranges are only available for a month or two each year, so stock your cupboard now. 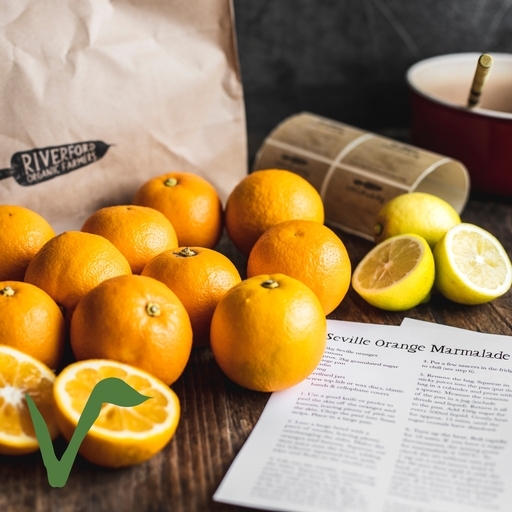 Kit contains: 1.5kg finest quality Seville oranges from Ave Maria farm near Seville, and two lemons. You’ll need 1.5-2kg sugar, a muslin bag and 9-11 standard jars (8oz). All produce is sold as Class II. We use bitter Seville oranges in our kit, the best variety for a traditional marmalade. Guy Watson (Riverford founder) visited Ave Maria Farm near Seville, where Amadora and her two daughters have been growing Seville oranges organically since 1986. Guy reckons you can't get much more organic than their beautiful orchards and is convinced that the resulting bitter-flavoured fruit makes the very best marmalade he has tasted.